Sivut on laatinut Juhani Niinistö, Helsinki. Yksityinen media-alan ammatillinen ja historiallinen sivusto. Eli kieliversiot eivät välttämättä vastaa toisiaan. Palautteet ovat tervetulleita osoitteeseen news @ ulkomaanmedia.net (väli lisätty). Juhani Niinistö has a long career in foreign language news coverage of Finland for international audiences. Juhani Niinistö was in charge of the news and programming of Radio Finland, the Finnish international broadcasting service in 1978-2002. See further down, about the history of external broadcasting from Finland. 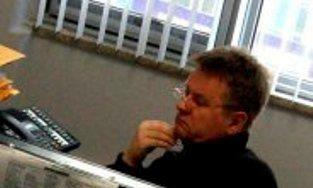 After Yle, he worked as editor in chief of the Toronto based bilingual (Finnish and English) weekly Vapaa Sana 2006-2011. Since 2014 he has been writing news about Finland for Xinhua, Chinese international news agency, as a freelance contract news writer. The history of Yle Radio Finland and the domestic foreign language Capital FM (Mondo). The site has no formal connection with Yle. News production at Radio Finland was administratively independent of the domestic Yle radio and tv newsrooms. Thus, while making full use of the domestic output. it was possible to break away from the domestic news agenda, when, for example, it was was dominated with the labour market situation. Juhani wrote several editions of the Foreign language news quality guidelines. At the height of its services, Radio Finland produced news in English, German, French and Russian, with the desk English desk in a central scripts role. Yle closed down Radio Finland gradually, starting with parts of the foreign language output from 2002. Juhani left Yle at the end of 2005. Juhani Niinistö's items in Finnish about Saynätsalo, a unique island community, on Lake Päijänne, with industrial background, now part of Jyväskylä.